A dream trip abroad… a major shopping spree… downpayment for a new car or condominium… make your wish come true with RCBC Bankard! Charge a minimum of Php1,500 to your RCBC Bankard and get a chance to win ONE MILLION REWARDS* POINTS in three (3) lucky draws. 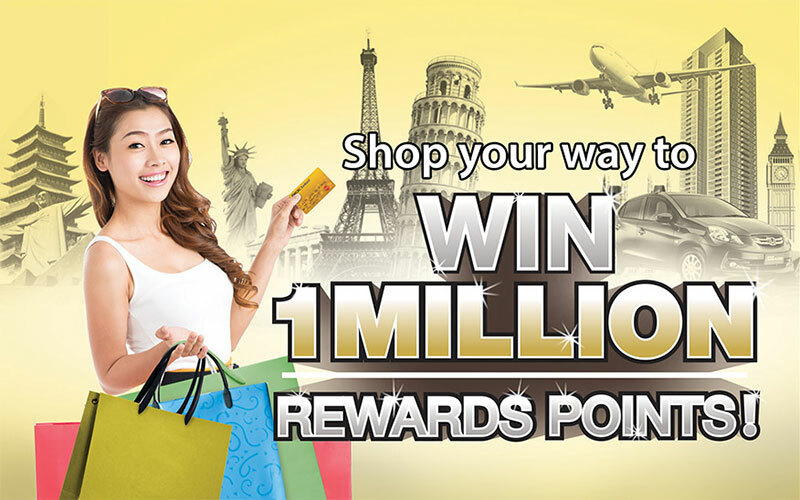 Use these points to get shopping vouchers, free flights for travel or other purchases… the choices are totally limitless! Use your RCBC Bankard now! Who knows, that swipe is the key to your One Million Rewards! 1. Promo period is from March 20 – September 30, 2015. 2. This promo is open to all Principal and Extension cardholders of RCBC Bankard whose accounts are active and current and in good credit standing. Purchases made by Extension cardholders will be counted under Principal cardholder’s account. 3. A cardholder must use his/her RCBC Bankard anywhere for a minimum single-receipt amount of Php1,500 (or US$35 for Dollar-currency cards), charged on straight or installment (i.e. monthly installment payment due for the billing cycle) and posted to his/her account within the promo period will earn for the cardholder ONE (1) RAFFLE NUMBER. 4. Online and purchases made abroad are qualified, provided the purchase amount required is met when transaction amount is converted to Philippine Pesos and posted to his/her RCBC Bankard account. 5. All purchase and balance conversion, annual membership fee, cash advance, late charges, and finance charges are excluded from the promo. 6. All employees of RCBC, RCBC Bankard Services Corporation, its advertising agencies and their relatives up to the second degree of consanguinity or affinity are disqualified from joining the promo. 7. RCBC Bankard holds the right to certify whether or not a winning cardholder is an eligible cardholder and his/her account satisfies the criteria set in the promo mechanics. 8. RCBC Bankard’s decision, in concurrence with DTI rules and regulations, regarding this promo will be deemed final and non-negotiable. 1. Raffle numbers will be electronically generated. See 1st batch of winners of Rewards Points here. 4. Electronic raffle draws will be at the RCBC Bankard Head Office, 30/F Robinsons-Equitable Tower, #4 ADB Avenue corner Poveda Street, Ortigas Center, Pasig City, in the presence of representatives from the Department of Trade and Industry (DTI) and RCBC Bankard. 5. Cardholders can qualify in all raffle draws provided he/she has qualified single-receipt purchases on the qualifying periods indicated. But cardholders can only win once for the duration of the entire promo. If a winner is drawn more than once on a draw date, cardholder wins the prize with the bigger amount. 6. RCBC Bankard will shoulder all applicable taxes of the raffle prizes. Raffle prizes are may not be converted to cash or transferred to another RCBC Bankard other than the account qualified for the promo. 7. To compute redemption of Bankard Rewards points in Peso equivalent: Redeemable Bankard Rewards Points x 0.25 = Rewards in Pesos. 1. Raffle draw winners will be notified by registered mail sent to their billing address. 2. Names of winning cardholders may also be published in a newspaper of general circulation and in RCBC Bankard’s official website and Facebook page. 3. RCBC Bankard accounts of winning cardholders must be active and in good credit standing at the time of the raffle and awarding of prizes. 4. Free Rewards points (or, its equivalent in cash rebate or Airmiles) due to winning in the promo will be automatically credited to winning cardholder’s account, on top of the usual Rewards earned by his/her transaction/s. 5. For inquiries on outstanding Rewards and how to redeem, cardholders must call RCBC Bankard Customer Service at 888-1-888 or log on to RCBCBankard.com. 6. All other policies, terms and conditions of RCBC Bankard Rewards program will be applicable.